Yesterday I had the chance of a lifetime: To go skydiving for the first time in my life. 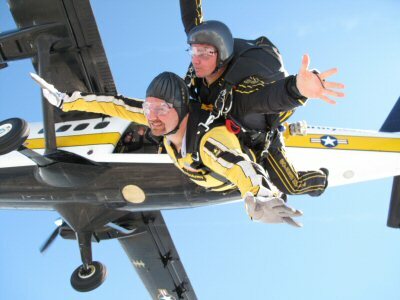 Not only would I have the opportunity to do jump out of a perfectly good airplane, but I’d get to do it with the best of the best when it comes to skydiving: The Army Golden Knights. The backstory to this skydiving experience is that I was asked by Greg Swan from Weber Shandwick (who does PR for the Army) if I’d like to go skydiving as part of a pre-conference event outside of Dallas Texas. After looking deciding there was an interesting social media SEO story to tell and feeling somewhat of a connection to the military because of my previous active duty service in the Army many years ago, I decided to do it. Here are my last words before the jump. I love you mom!